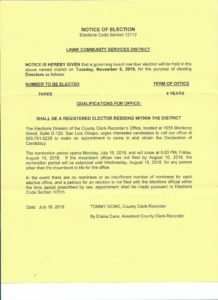 The Elections Division of the County Clerk-Recorders’s Office, located at 1055 Monterey Street, Suite D-120, San Luis Obispo, urges interested candidates to call our office at 781-5228 to make an appointment to come in and obtain the Declaration of Candidacy. The nomination period opens Monday, July 18, 2016, and will close at 5:00 PM, Friday August 12, 2016. If the incumbent officer has not filed by August 12, 2016, the nomination period will be extended until Wednesday, August 17, 2016, for an person other than the incumbent to file for the office. In the event there are no nominees or an insufficient number of nominees for each elective office, and a petition for an election is not filed with the elections official within the time period prescribed by law, appointment shall be made pursuant to Elections Code Section 10515.